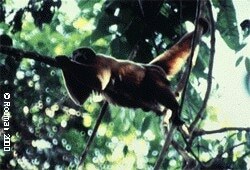 The Lowland Woolly Monkey was first reported by Schinz in 1844. It inhabits Brazil, Ecuador and Peru. This particular species is currently (2003) listed as vulnerable. It is also sometimes referred to as Poeppig’s Wooly Monkey. They are frugivorous feeding mainly on fruit, but are also known to feed on insects. They live in social groups of both males and females anywhere between a few and up to forty. There has been little research carried out into this particular species of monkey. E-mail to add your Lowland Woolly Monkey related website.